We had a great sleep, dad snores like a steam engine and I grind my teeth like mating dragons so together we’re an orchestra of slumber. We got up around 7 and headed down to a buffet breakfast by 7.45. It turns out that there’s quite a few families staying here, the breakfast room was packed but we found a spot and I ate everything from coconut rice and rendang to croissants and coffee. We headed out on foot to check out Fort Rotterdam but ended up chatting to a rickshaw driver called Ali, he wanted to take a few customers around so that he could head back to his kampung for Eid, Fort Rotterdam was shut so we squeezed our bums in to the tiny plastic seat and cycled off to look at some Prau at the old Makassar docks. It turns out that Ali had visited Darwin and Kununnurra on a wooden boat when he was a young man. The boats are amazing, they sit really low in the water with these dramatic sweeps up to the prow and a full cabin, 2 or 3 stories high at the back, ornate doors, balustrades and heavy rudders. Many of them were being repainted and docked for repairs. The water was still and thick with plastic refuse, piles of rubbish smouldered and tall, scraggly roosters plucked through the mess with angry eyes. I felt bad taking photos when I could see people sleeping in the boats, the rows of little shops were all shut and the only movement was a few colourful families loading into wooden boats to visit family on the islands. We jumped back on board and headed off to Masjid Raya, the oldest and largest mosque in Makassar. 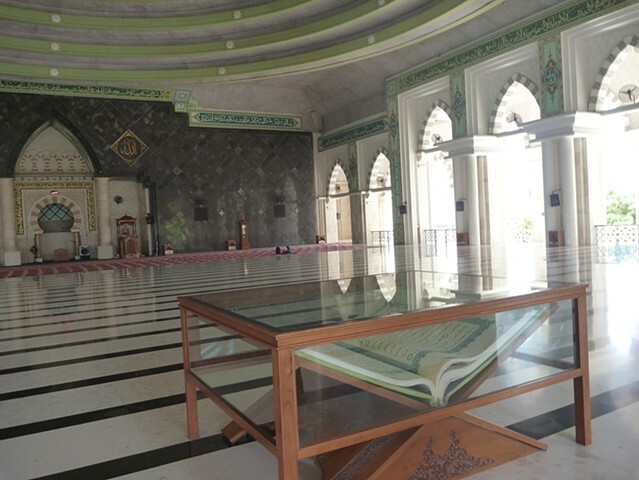 They had a 500kg hand written Quran under glass at the entrance, it looked like a conservators nightmare sitting there in the sunlight, a half ton of paper and ink. We prayed a couple of rakaat out of respect and headed to Fort Rotterdam. The compound was built almost 500 years ago, it’s a proper bulwark of the Dutch colonial mission to subdue, convert and make money from the natives. The La Galigo museum was spread throughout a few of the buildings offering tired summaries of the La Galigo period, complete with locally painted impressions of ancient life, dioramas and a few traditional artefacts. Much of the exhibition was in Indonesian while the few translations tended to wander off into pigeon. I’m on a bit of a mission to see canoes for my own research so I got to have a look at a very nice dugout, perfect for the jungle rivers. The compound was fairly empty, everything is shut until 5 this evening, Hari Raya here is a four day holiday and everyone seems to be sleeping. On boats, in the mosque, on rickshaws and in building sites. We headed back to the hotel for lunch and tucked into another buffet. I came back down to the room and dad is kipped out, I think I might have a nap too after I’ve thrown down a quick record of the day so far. I’m really glad I’m here with him, people love that he speaks bahasa so well and that we’re Muslims from Australia. He’s great at chatting to strangers and they love a big white beard. They’re very surprised that I’m a Muslim, I don’t look the part. Tonight we went for a bit of a stroll down Losari beach, it was packed with families out and about, makan angin (eating the breeze). Kids on bikes and pisang goreng (fried banana) everywhere, people selling drinks, rocks and trinkets. We stopped into the Masjid for Maghrib prayer, I got really sweaty until I was dripping off the end of my nose and I had to get out again straight after. It was the first time I’d prayed in a mosque for a while but these things are second nature, back on the bike. We wandered up the beach which is more of a concrete pylon arrangement looking down onto very still, filthy black water. Kids were out in paddleboats covered in fairy lights and it looked like old coffee. People would greet us a lot, shake hands and stop to chat with dad like he’s a proper guru, some little girls got a photo with him in Makassar Art Gallery. The gallery was more of a tourist shop with paintings of Tana Toraja, water buffalo and old men, there was some very slick hand skills on show. We wandered up to the end, weaving our way through scooters, kids and families and sat for a bit outside another mosque. A few jamaat guys came and sat with us and dad chatted away, it was pretty clear that I couldn’t understand but dad was happy chatting. We wandered back up another street full of gold shops, most of which were still closed and headed back to the hotel for dinner. We’ve been avoiding the street food a bit, being a little cautious of getting the guts out of wack and ended up drinking the best Teh Tarik ever, they don’t make it here but the waiter had trained in Malaysia and did the best job ever. Dinner was much more expensive in the hotel but the food is amazing and it’s a short stumble up to our room. I’m not exactly partying it up, back at the hotel at 8pm on a Saturday night but that’s what I wanted. There are almost no tourists here, everyone is kind of curious and very smiley, the kids are ridiculously cute and the people are really laid back.